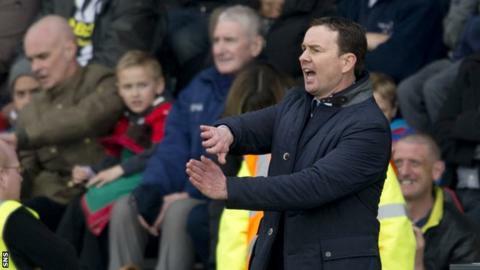 Ross County boss Derek Adams was left to rue missed opportunities in their 1-0 defeat by St Mirren in Paisley. Gregg Wylde's strike 11 minutes from time eased St Mirren's relegation play-off fears and added to County's. "It was obviously a big goal for St Mirren - it pulls them away from the pack," said Adams. "We had Richard Britton who hit the bar, we had Robert Quinn who hit the bar, we had Alex Cooper who was through one-on-one twice." County are 10th in the table, one point better off than Kilmarnock, who visit Hearts on Sunday. And Adams conceded that it was a "fantastic strike" to win the game at St Mirren Park. "They've won the game because they've won the game and taken their chances," he said. "In the second half, I thought we were the better side - in the first half, I thought St Mirren were. "It's very tight at the bottom of the league and we've got two games to go. We'll see how we get on against Hibernian on Tuesday night; I thought performance-wise we played well. "They (St Mirren) have got 4,000 fans here and a lot of support. We had a good travelling support as well. "In the end, it was a good football match for the public to see, we're just disappointed we've lost the game, but you can't take away from the quality of goal it was."